Solar Newtonian 8" - SolarChat! Earlier this year and, inspired by Christian Viladich, I constructed an 8" Solar Newtonian shown below. An 8" f/6 mirror was purchased and de-aluminized with ferric chloride pcb etchant. The concept was to replicate a Baader Herschel wedge in that a de-aluminzed mirror reflects 4% incident light and, the Baader wedge reflects 4.6%. 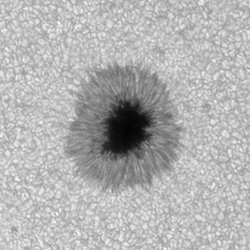 With the addition of a filter pack consisting of: Baader Solar Continuum filter, IR/UV cut filter and a Neutral density 3, this replication should be accomplished. The secondary was left aluminized. A truss tube design was used and I added my own version of a remote focuser and a rear projection finder. The whole system was mounted on an EQ6 GEM. First light was disappointing to say the least even with careful laser collimation. Though exposures were similar to using the Baader wedge on my 115mm refractor, it was next to impossible to obtain sharp focus. A best example follows but, was rare compared to most others. Multiple E-mails traveled back and forth with resulting suggestions like the following: re-collomate using a star (night skies have been cloudy); should the rear surface of the primary be ground or polished (someone claimed improved results by coating the rear ground surface with microscope immersion oil) I found no difference; cover the rear surface of the primary with flat black paper - some improvement but not impressive, etc. By now, I began to question the primary mirror's figure and sent it to Gordon Waite for testing - he gave the mirror high marks for quality. One less variable to deal with. Then it was suggested that some lunar images be taken and, these were passable unless I used my 3x's TeleVue Barlow. The Barlow is a standard part of my solar imaging with the DMK41 and, I'd hate to be with out it. What I'm coming to believe is that Barlow/filter pack combination disagree with my scope - I'm otherwise running out of ideas. Have spent hours on Google with out any solution. So, HELP ! Hopefully, someone may have other ideas - I may be stuck in my own mental "box". Thanks for the encouragement Derek. With my TS 115mm APO triplet and the Baader wedge, I've almost always been able to focus to max. under good conditions. The reason for going to the 8" Solar Newton was to take advantage of Dawe's limit with the larger optics. The TeleVue 3 x's is a very good Barlow and, I just can't figure out why it is failing now in this configuration. I'll certainly keep up the battle. Do you have a completely unprocessed image straight out of autostakkert you can post - no wavelets in registax, no PSP etc. Here are 3 from best (rare) to poor with the middle one being the most common. Today, I'm going to substitute the Solar Continuum filter with a 58A and add a .09 ND at first. The others will include the ND3 and the IR/UV cut filters. I have a suspicion that the "apparent" silvered surface of the Continuum filter may have some interplay with the secondary - grasping at straws ? Not sure where you're going with your request for non-Wavelet images. When focusing with my remote setup, I go in and out but, never quite get full "height" sharpness in the image. Many thanks for your interest - will keep surging on. As noted earlier, this was never a problem with the refractor/Baader wedge/DMK41. I also suspect poor seeing. Can you set up a similar size telescope (closed-tube Newt, SCT8) simultaneously and take comparison pictures? Thanks for your input - I appreciate all the assistance I can get. I use a TS 115mm APO triplet w/ Baader wedge quite regularly under the same seeing conditions and rarely have a problem getting clear and sharp images limited only by its small size. I repeated images this morning with the Solar Newton trying different filter combinations (swap Solar Continuum with #58 green + ND 0.9) as well as different Barlows. The Solar Continuum wins over the #58 green + ND 0.9 and, although slightly improved over previous images, the Barlows deteriorate as power increases. Optically, I think the setup is OK given reasonable lunar images. The problems arise when filters and Barlows are added. At my latitude of 19.28, the sun is adequately high for most of the day. This problem is quite puzzling and having adverse effects on my receding hairline. Yet, it may well turn out to be something very simple that has been overlooked. The mount/pier also as heat waves go up. white painting/white coton shreds ? Your images seem really noisy, I think this is also one of the issues here. What camera are you using? Do you use gain when imaging? How many frames do you capture and how many do you stack? I agree - the images look very "noisy". However, even before capturing a single frame, the image on the monitor is similar and not clearly sharp. This is the fundamental issue. I use a DMK41 with very little gain and, keep the exposure low enough to get full frame rate. I've also tried my ASI120MM and ASI174mm with similar results. I usually capture 300 frames and stack 25% or less. Capture software is SharpCap 2.6 though results are no better with FireCapture 2.3. Stacking is with AutoStakkert!2 using different sized AP's without much difference - 50 seems the best. And, Wavelets are done sparingly in Registax 6 in both Default and Gaussian modes. Sometimes, I've stacked the full AVI file in Registax 6 but, in the first window, whilst scrolling through the frames, few are sharp and, Registax chokes up. I've since constructed a 120 mm computer box fan to cool the mirror and, will try it out once the clouds clear. In response to zorgdotnl's post, the mount is white (SkyWatcher EQ6). I've considered making a Lycra "sock" but trials with just a towel over the truss frame made little difference. As for flat black coating of the inside of the tubing, I know of two scopes which use a solid tube and do not have my problem. So, the saga continues. I acknowledge variations in viewing conditions and, may have become spoiled using my TS 115mm APO triplet/Baader wedge where this problem rarely exists. I still believe that the problem is related to the Barlows and filter pack since the lunar image without a Barlow was passable. Would love to be proven wrong with a solution. As an aside, Christian Viladrich uses a CA-k filter rather than a Solar continuum - I wonder if there is a clue here ? I read very interested about your problem with your Sun-Newtonian. Before you de-aluminized your mirror, as there was the quality at very high magnifications , possibly the star test with 400x -800x ? When you capture with the ASI / DMK, do you use any histogram for proper exposure ? Set by changing the parameters the histogram to the far right , then it does not rushes . The max. gain for a DMK is 400....for the ASI i dont know. Use "google" to look for " exposure to the right" in the internet. You had use a DMK-41. The best focal ratio is ca. 17, like the railey- or dawes criterium. But your Newtonian has a secondary mirror, so reduce the f something. Sorry, when i overlooked something. Prior to de-aluminizing, the mirror was used successfully both for night visual observing and imaging. That was some time ago and, I can't give you details as to respective magnifications. You may not be aware that the mirror underwent full Foucault and Rhonchi testing by Gordan Waite who concluded the mirror was above average figure. In the past, I used to use the Histogram with both FireCapture 2.3 and SharpCap 2.6 but, now I can just estimate the grey scale based on prior years in my darkroom with film and printing in the old fashioned way of imaging. As I've noted before, the prime issue is focusing particularly, with any one of several Barlows. I just cannot get a crisp image on the monitor. It's as if there is a film of haze somewhere in the optical path. No amount of post processing will correct for a poor initial image. When I look at the unprocessed image I see a cross hatch pattern across the image. I initially thought this was a artefact of a 4 vane spider, but, I see it is a 3 vane, so this is not the cause. Almost looks like astigmatism to me, but if the barlows all work on the frac then no issues with them. I see the primary mirror looks frosted on it's rear surface in image. Have also tried a 8" solar newt and when we did it the mirror was clear. I wonder if you have some scattering. I would also try tilting the solar continuum too, see what happens there. Thanks for your followup post. Your comment on the rear surface of the primary is interesting. Christian, in this link: http://www.astrosurf.com/viladrich/astr ... /N300.html speaks against a polished surface. On the other hand, I recall and earlier post by someone else who used microscope immersion oil to "clear" the frosted rear surface and, thought this was better. I tried using Vaseline for the same effect bur, saw no imaging difference other than streaking owing to the uneven application of the jelly. Also, I tried placing a disk of flat black paper in the mirror cell behind the primary - improvement was slight but, the paper came to higher temperatures than the front of the mirror - something like 41 degrees C vs. 35 degrees C with an IR thermometer. When you tried your 8" clear solar newt. how were your images ? Particularly when you used a Barlow. Not quite sure how to tilt the Solar Continuum since it is screwed into a pack and perpendicular to the OA. Please don't give up - every suggestion will be followed up on. Next, I'll try my completed mirror cooling fan and then, give some thought to repainting the inside white. I have been very pleased with the performance of my Televue barlow. When I first used it on Saturn, it was a little disappointing as my telescope was not collimated. The manufacturer’s statement about the telescope being perfectly collimated at the factory doesn’t mean anything if the factory is in China! All it takes is some rough seas, and you need to invest in a collimation tool. Once I collimated the telescope, results were much better. I have not noticed any visual distortions when using the barlow, not even at the edge of the field of view. I was able to find the central star in M57 using the barlow to reach 200X. Also at 200X, M13 filled my field of view and I was able to distinguish between blue and white stars with my 8” reflector. The best view I have had of M13 was through a 13” reflector at 375X, and I could make out some red stars near the core of M13. But my telescope is smaller and was viewing M13 at lower magnification, so I cannot blame the weaker performance on my barlow. Overall, images were crisp, and I have not noticed any differences in image quality when viewing with just my Meade Series 4000 Super Plossls or when using my barlow in conjunction with these same eyepieces. I have noticed that it is difficult to achieve sharp focus higher than 200X, but that appears to be more of an issue with my standard rack and pinion focuser. I am looking into a focuser upgrade to correct this problem. To use a Barlow with a SC or Newtonian, for high magnification, you must have a very good collimated Scope. Today i talk with Kurt, a 76 years old semi-profi astronomer and a very good friend. He had built more than 20 self made telescopes, Cassegrains, Dall-Kirkham-Cassegrains, Cassi with primäry and Nasmyth focus, and a solar newtonian too. He said, your problem is the truss-tube. You need a closed tube, GFK, GEAX....and a spcially air ventilation, because the mirror is slightly warm and a thin warm layer of air is created and ruined the image. Many thanks for your post - your English is much better than my German. I would agree with the excerpt on the TeleVue 3 - it is a very good Barlow but, as such, it will magnify any imperfections presented to it. Your friend Kurt raises interesting points regarding open vs. closed tubes. This is a controversial area as there have been posts on both sides of the argument. Christian Viladrich and Art Whipple are for the open tube and, Francois Rouviere uses a closed system. Both are able to capture excellent images. I am giving thought to covering my truss tube with Lycra "socks" and will see how that works. Also, I've constructed a 120mm computer box fan to draw air away from the rear of the primary - yet to be tested. As an aside, there was a 32 cm. floor fan, which we use to ventilate the observation deck, within one metre of the scope. I have wondered whether it was creating air flow near the scope which could be responsible for my problems. Today, I turned it off and, although viewing conditions were not great, I believe my captures were better than before. I'll have to pursue this when conditions are improved. Collimation is always an issue - I've collimated and re-coollimated the scope with variable effect. May have to borrow or, purchase another laser collimator for comparison. Though it has been often suggested that a "star" collimation be done, our evening skies have not been clear recently. I've not given up yet. Ask them how thick are there mirrors and which kind of material are there mirror. Each mirror substrate behaves differently. Here is the link to the mirror I purchased - it is an 8" f/6 mirror made of BK-7 glass and, is one inch (25mm) thick. Here is a table of some of its qualities. It does have quite a high coefficient of expansion compared to others - could be the problem. Will try my cooling fan later. You and your friend Kurt may be on the right track. Until you raised the question of "what glass ? ", I'd not given that aspect much thought. After looking up the properties of BK-7 and seeing how extremely high its coefficient of expansion is (83 for BK-7 and 4.8 for quartz), this may be an important issue. Given that 96% of incident light passes through the mirror, it could be adversely affected. Meanwhile, I tried imaging using my fan on the rear of the primary. Firstly, I had it extract air by blowing out - this made a little difference. Then, I reversed the fan so that it blows on the back of the primary. Though viewing conditions were poor and a moderate breeze was present, it was my impression that the monitor images were much improved but, not perfect. IR temperature measurements of the front mirror surface showed it to be consistently about 31.8 degrees C. As I recall, previous measurements without the fan were as high as 38 degrees C.
I think the fan addition is worthwhile but, the mirror glass needs to be reconsidered as well. I note that Teleskop-Express has an 8" f/6 QUARTZ mirror at a reasonable price and, having been pleased with their service in the past, I may have to consider this as a new purchase. I'll keep trying the fan setup in better viewing conditions to see what happens. Otherwise, it may be necessary to buy a new mirror. Out of curiosity, what would be the consensus among members on the following two questions ? 1> Replacing my current BK-7 mirror (coefficient of expansion = 83) with a quartz mirror (coefficient of expansion = 4.8) - that's more than a 17 fold difference. This option would require an expenditure of some U$500 and, the question is, would it be worth it ?. 2> Repainting the inside of both upper/lower tubes and middle box in white. I've seen advocates for both versions. I can test this out by placing white cardboard inserts to see if any difference results. Aside from variable/poor viewing conditions and collimation, the above may be significant variables. I do really appreciate everyone's help so far. I wouldn't do any hardware changes at the moment. I think there are cumulative factors at play here producing the end result; I don't think your seeing is supporting 8" aperture at 540nm, i'm not convinced you are getting good focus (as a result of poor seeing) and I think there is room for improvement with the stacking and post processing. I would try an off axis mask around 3-4" aperture and see what you get, try shots without the barlow, and with. Don't use any gain on the camera, use the ND0.9 instead of the ND3 in combination with the UV/IR Cut and continuum filter. Try capturing 1500 frames per avi and stacking 100. Lets get some raw data and we can take the PP from there. Thanks for your reply. I'll hang onto my $500 for the time being. I agree that there could be multiple factors involved here and, seeing conditions play a major role recently. As for stacking and capture, I've used FireCapture 2.3, SharpCap 2.6, Registax 6, Avistack 2 and AutoStakkert!2 in various combinations. None of these are new to me and having made observations almost on a daily basis for the last few years, I feel comfortable with any of them. No combination so far has been able to deal with my raw AVI's which are consistently variable in focus. Adding the cooling fan has helped significantly in that as I monitor the image in SharpCap, some moments yield good images though, not enough to provide a reasonable final image. Recently, wind has been an issue as well. I've tried stacking fewer frames without success - 10%. I always keep gain to a minimum and, have tried several variations of Barlows. The off-axis mask seems like a good idea and I'll try it out next week. I do have a collection of ND filters and will try some lower versions still with the Solar Continuum and IR/UV cut filters. That may allow for a slight increase in fps though, the DMK41 maxes out a 15fps. Though I have an ASI174MM, I don't yet have a USB3 connection in my PC. May even try out a polarizing filter too. Have tried capturing AVI's with more frames and stacking a very small percentage - not much difference. Will also make up some white cardboard panels to line the inside of the OTA. So, you can see that many options have been tried thus far with more to come. There remains the question of fps - have been looking into a Basler, some of which achieve rates of 150+. Will keep all up to date as the saga continues limited by weather. Just a quick follow up on your suggestions above. I tried an of axis 3" diameter mask without benefit. Also tried a polarizing filter with no change. Revising the filter pack to replace the ND3 with an ND1.8 made the most significant difference thus far. Though viewing conditions have been poor (can't even get decent images with the refractor/Baader wedge), watching SharpCap's capture screen is interesting. Though there is much scintillation and movement owing to turbulence and the wind, my sense is that the images are much sharper among those flickering by given to the shorter exposure time. I can cut back on Exposure by one level and, Gain remains very low. Nonetheless, max frame rate is 15 fps with the DMK41 and, by the time a full AVI set is captured, there will have been a lot of movement. It may be worthwhile to upgrade the camera to USB3 - working on it. You may be right about the seeing conditions not supporting this 8" scope at 540nm. Time will tell. I acknowledge the 1% rule. All of this precludes stacking - no amount will improve a crappy capture. However, working at the capture level alone, there is still more to be done. I am reasonably confident with my stacking efforts provided the capture is good.